Cincinnati Reds starting pitcher Sal Romano throws in the first inning of a baseball game against the Washington Nationals Sunday. Cincinnati Reds second baseman Scooter Gennett (3) misses the tag as Washington Nationals’ Trea Turner, right, steals second in the first inning of a baseball game Sunday. CINCINNATI (AP) — Bryce Harper hit two home runs, leadoff man Adam Eaton capped his big opening series with a two-run drive and the Washington Nationals beat the Cincinnati Reds 6-5 on Sunday for a three-game sweep under new manager Dave Martinez. Eaton returned from a knee injury that wiped out most of his 2017 season and figured prominently in all three victories, going 8 for 13 with two doubles, two homers, five RBIs and six runs scored. Eaton singled and scored in a 2-0 opening win, went 5 for 5 with a homer in a 13-7 victory, and opened Sunday’s game with a single. Anthony Rendon followed with his first homer off Sal Romano (0-1). Eaton also had a two-run shot in the seventh inning. Harper connected for the first time in the sixth and again in the ninth inning, giving the Nationals a franchise-record eight homers in an opening series. He’s homered in the Nationals’ opening series each of the last six seasons. Gio Gonzalez (1-0) threw his best game last year against the Reds, going a season-high 8 1/3 innings for a 5-0 victory on July 14. He handled them again, allowing only five hits and one run while pitching into the seventh. The Nationals have gotten off to their perfect start with impeccable starting pitching. NL Cy Young winner Max Scherzer, Stephen Strasburg and Gonzalez allowed only two earned runs combined. The Nationals’ bullpen struggled to hold it. Sammy Solis gave up Billy Hamilton’s RBI double in the eighth and loaded the bases with no outs. Ryan Madson induced Adam Duvall’s double-play grounder that undercut the rally. Sean Doolittle gave up Phil Gosselin’s two-run homer in the ninth before fanning Hamilton to get his second save. The Reds never led in the series, which began with the opener pushed back a day because of rain. Cincinnati is 0-3 for the first time since 2003, its inaugural season at Great American Ball Park. Reds: Closer Raisel Iglesias returned from a three-day paternity leave and pitched the ninth, giving up Harper’s second homer. The Reds optioned reliever Jackson Stephens to Triple-A Louisville to open a spot. Stephens gave up a pair of runs in one inning on Saturday. Nationals: Open a three-game series in Atlanta, with Tanner Roark facing left-hander Sean Newcomb. Roark is 6-3 career against the Braves with a 2.88 ERA in 13 starts and six relief appearances. Reds: Remain home for a two-game series against the Cubs, who have won 30 of the last 41 games between the NL Central rivals. Tyler Mahle makes his fifth career start and his first against Chicago, which starts Tyler Chatwood. 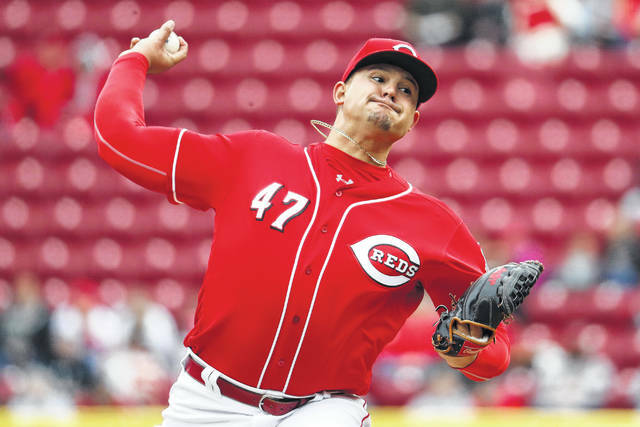 https://www.limaohio.com/wp-content/uploads/sites/54/2018/04/web1_Reds5.jpgCincinnati Reds starting pitcher Sal Romano throws in the first inning of a baseball game against the Washington Nationals Sunday. https://www.limaohio.com/wp-content/uploads/sites/54/2018/04/web1_Scooter.jpgCincinnati Reds second baseman Scooter Gennett (3) misses the tag as Washington Nationals’ Trea Turner, right, steals second in the first inning of a baseball game Sunday.